EUGENE, OR—Historians at the University of Oregon announced Wednesday that a recently discovered journal appearing to have belonged to Shoshone guide Sacagawea details dozens of times in which the Native American woman tried to ditch Meriwether Lewis and William Clark on their 1804 cross-country expedition to the western part of the United States. 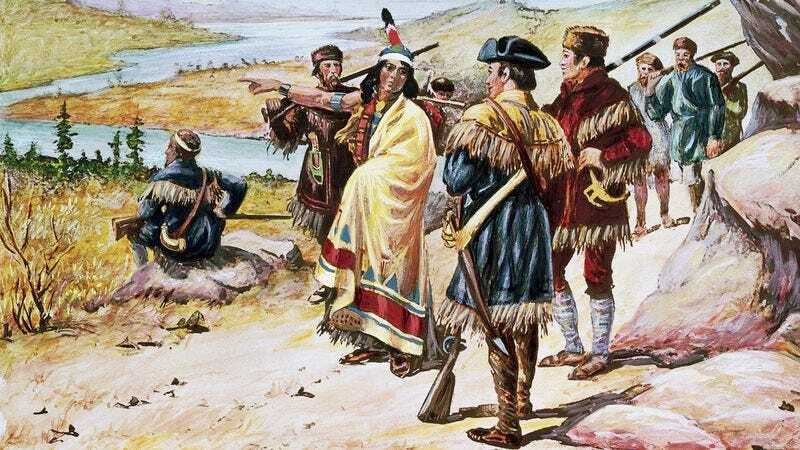 “I hid behind some rocks at the headwaters of the Columbia River, but they found me again—I quickly made up something about a special kind of fish I was kneeling to get a better look at,” the journal read in part, one of many moments in which an exasperated Sacagawea, claiming she “did not have the time to drag a couple of palefaces through the wilderness,” attempted to leave her incompetent companions behind. “When we get to the plains, I’ll dump them with the Pawnee. These two are probably going to die pretty soon, anyway—the red-haired one, Clark, keeps eating berries I tell him not to eat.” According to the journal, Sacagawea was at one point able to lose Lewis and Clark for several hours in a dense pine forest in Montana, but took pity on the pair and returned to free them when their fringed buckskin breeches became badly tangled in some bramble bushes.